Enter your email address to always get Morning Consult’s latest work. Northam is now 19 points underwater in the commonwealth, with 48% disapproving. 50% of Democrats approve of his job performance, compared with 70% last month. Voters in Virginia have soured on Gov. Ralph Northam (D-Va.) in the immediate aftermath of the blackface scandal that has many leaders, including top Democrats, calling for him to resign. 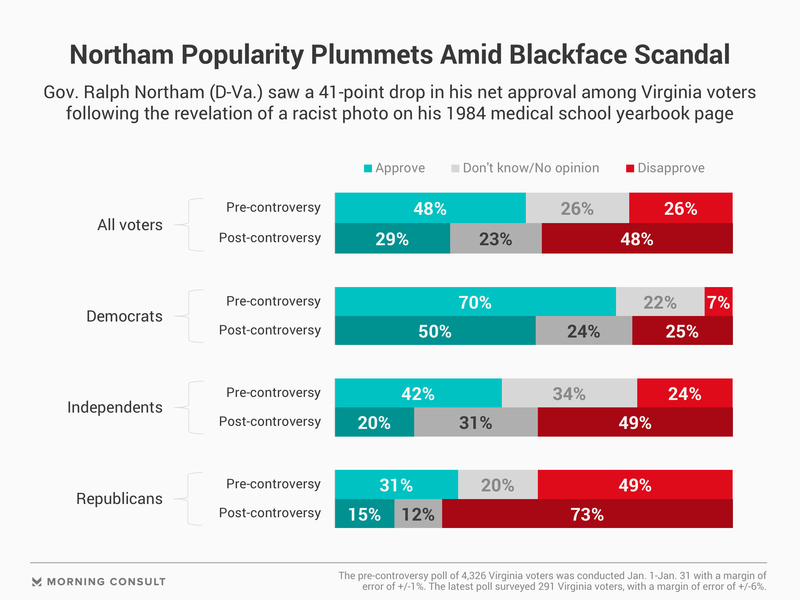 Morning Consult tracking found a 41-percentage-point drop in Northam’s net approval rating — the share of voters who approve of his job performance minus the share of those who don’t — in the two days after a page surfaced from the governor’s 1984 medical school yearbook showing a picture of one person in blackface and another dressed as a member of the Ku Klux Klan. The polling of 291 Virginia voters, which was conducted Feb. 2-3 and has a 6-point margin of error, found 48 percent disapproving of his job performance, up 22 points from a Jan. 1-31 survey of 4,326 Virginia voters that had a 1-point margin of error. His approval in the latest poll was 29 percent, down 19 points from the prior survey. Among Virginia Democrats – who nominated the then-lieutenant governor in a competitive 2017 primary over former Rep. Tom Perriello by 12 points, 56 percent to 44 percent – Northam saw his net approval drop 38 points. Fifty percent approved in the latest survey, down 20 points from January, and his disapproval rose 18 points to 25 percent. The governor suffered a steeper, 47-point drop in net approval among independents, with just 20 percent approving and 49 percent disapproving in the latest survey. The subgroups have a large margin of error – plus or minus 10 points for Democrats and independents – but do reflect the downward trend demonstrated in the overall poll. Northam is somewhat insulated from political pressure due to Virginia’s election laws, which bar governors from serving consecutive terms in office. However, Kyle Kondik, managing editor of Sabato’s Crystal Ball at the University of Virginia Center for Politics, said unpopular chief executives typically have a negative effect on the party. Correction: A previous version of this article misstated the date that the January survey concluded.